Hazelnuts are some of the heartiest nuts available and vanilla is a classic and sweetly decadent flavor, which is why this Vanilla Hazelnut flavored coffee is a perfect form of indulgence. Made with 100% authentic Arabica beans, this gourmet flavored Vanilla Hazelnut coffee will envelop your taste buds with its full flavor. 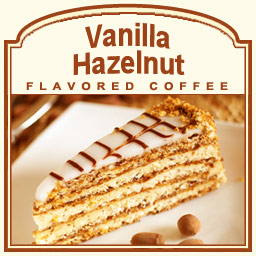 Although this coffee is perfect for your early morning cup of joe, this Vanilla Hazelnut flavored coffee makes an exceptional dessert coffee with its light sweetness. Roasted and shipped on the same day, the Vanilla Hazelnut flavored coffee will be packaged in a heat-sealed valve bag ideal for optimal freshness. With only 2 calories in each cup, you can give into the richness of Vanilla Hazelnut without feeling guilty.